We’re a week away from a very special wine and chocolate event with world-renown chocolatier Jacques Torres taking place at my listing, Hale Ku Mana at the Four Seasons Hualalai. World famous chocolatier Jacques Torres will create special confections for a wine and chocolate pairing at Hale Ku Mana June 7th. Get your tickets today! The chocolate and wine pairing will be held on Thursday, June 7, 2012, from 5:30 p.m. to 9:00 p.m. Make sure you get your tickets soon because only 40 tickets are available for this exceptional event. After all, it’s not every day you get to sample creations from one of the most famous chocolate confectioners in the world while sipping on select wines at a luxurious Hualalai ocean view estate! French-born Jacques got his start as a pastry chef (he’s Dean of Pastry Studies at New York’s International Culinary Center), but he soon developed a deep passion for chocolate. In fact, he was the first artisan chocolatier to start from cocoa beans to make his own chocolate. Jacques is the youngest chef in history to ever earn the prestigious Meilleur Ouvrier de France medal (the Best Pastry Chef in France). He’s won awards and accolades around the globe including being named James Beard Pastry Chef of the Year and Chocolatier Magazine’s 10 Best Pastry Chefs. For 11 years Jacques worked as executive pastry chef at New York City’s prestigious le Cirque restaurant where presidents, heads of state, and celebrities dined on his confections. In 2000, he opened the first of his two chocolate factories where he specializes in creating fresh, hand crafted chocolates that are sold at a handful of select sites in New York City. Jacques is in town for the Big Island Chocolate Festival and has graciously agreed to provide and prepare chocolate for the special event at Hale Ku Mana. Farsheed Bonakdar, President of the Kona Cacao Association, will also be on hand providing chocolate for the event. Because man cannot live on chocolate alone (pity) all the food for the evening will be catered by Hubert Des Marais, Executive Chef at the Fairmont Orchid Hawaii Resort, who also happens to be a big fan of Jacques. Wines offered during the evening have been specially paired with specific chocolate creations to fully embrace the flavors and notes of each dessert. Wine for the event is being partially sponsored by Kona Wine Market. All of this wonderful confection perfection is taking place at Hale Ku Mana (House of Spiritual Healing), a truly luxurious tropical estate in Hualalai, the most exclusive resort community on Hawaii Island (commonly called the Big Island). 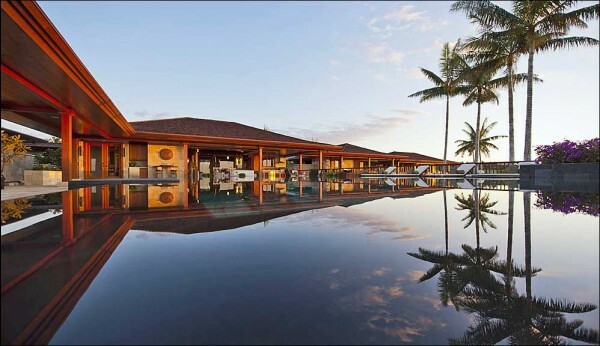 With stunning ocean and mountain views, Hale Ku Mana epitomizes Asian architecture adapted to the Hawaiian landscape. It features more than 10,000 square feet of living space, an infinity edge pool, Jacuzzi, five bedrooms and a master bathroom so incredible it was recently featured in Forbes Magazine. Tickets are $100. For more information visit the Big Island Chocolate Festival’s website.